Photo Courtesy of the Japanese Communist Party. May Day as an international day celebrating labor began with a brutal 1886 strike in Chicago, Illinois, where workers were fighting for the eight-hour work day. Police intervened in a confrontation between locked out strikers and replacement workers and several striking workers were killed by the police. At a demonstration in Haymarket Square in Chicago a few days later to protest the police brutality, a bomb exploded, killing several policemen. Eight anarchist trade unionists were arrested for the bombing, charged with murder, and sentenced to death, although the evidence against them was weak. Their execution became an international cause celebrate in the labor movement. Three years later, in 1889, the Communist Second International, meeting in Paris, declared May 1 an international day to commemorate the Haymarket defendants. 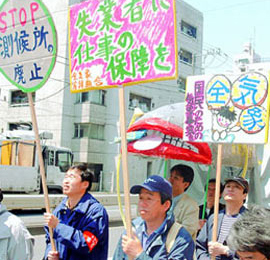 Like their counterparts in many countries, Japan's trade union federations and left political parties also celebrate May Day with demonstrations and protest marches.